Test Drive is a new series that we’re starting at CrunchGear wherein we get a hands-on look at new or interesting modes of transportation. It’s not limited to just cars, either. We’ll take a look at just about anything from scooters to rockets and everything in between. I’ve always been a tad averse to Volkswagens since my days in HS. For some reason, I always associated a VW with a girl’s car. Perhaps the flower holder in the Beetle was a bit much, VW. I simply could not be associated with any brand that touted a flower holder as a feature. Heh. I would have given my right arm for a mint Scirocco, but all the ones I could find were in disarray having been driven hard by those ‘racer’ types. When the parental units are doing the purchasing – you tend to keep your mouth shut and hope they don’t pawn the old family van on you. For the better part of a decade, I’ve steered clear of VW – mainly because I don’t drive anymore- but I have to hand it to them with their recent ad campaign. They’re clever and the viral online campaigns are a big time sink, which is smart on VW’s part. VW is one of the very few brands that find a way to thrive and not just survive when times are tough. And what better than to offer a sophisticated looking ride that offers countless amenities, a smooth ride and that doesn’t hit your wallet too hard? Enter the CC. Admittedly, the CC doesn’t quite have all the tech-related features we look for when taking Test Drives, but there are a few notables from our gadget-obsessed perspective. We drove around the CC Sport edition, which is the base model 4-banger with a 2.0L Turbo that gets a respectable 21MPG in the city and 31MPG on the highway. It comes as a 6-speed manual or 6-speed automatic with Tiptronic that starts at $27,100. You can opt for the Luxury (same power plant as Sport), VR6 Sport or VR6 4Motion models that have a 3.6L, VR6 powerplant with 280HP that tops out at $39,800, but they only come with automatic transmissions. When traversing a city you’re unfamiliar with, GPS certainly comes in handy, right? As a $2640 upgrade, the “technology package with MDI (Media Device Interface)” would probably be the one upgrade I’d opt for. And I suppose the Bluetooth option is worth the $275, or of course a dorky $50 Bluetooth headset would suffice as well. So, the MDI supports USB devices other than your iPod, like hard drives or flash drives, and displays ID3 tags with full control over devices via the touch-screen interface. There is, however, a USB port in the glove box as well if you choose not to opt for the tech package. Also included in the package are Sirius satellite radio, CD, DVD and a rear-view camera that’s inconspicuously hidden in the rear badge. For the gadget-obsessed like myself, the CC has three 12V power outlets placed in the main cabin, rear cabin and trunk. It’s not an AC outlet, but it’s certainly better than nothing and it comes with every trim. While not available in the Sport or Luxury model, the 10-speaker Dynaudio system puts out a total of 600W for adequate easy listening while on the road trip. Miley Cyrus sounded great, as did Smoosh. One of my pet peeves is people who leave their blinkers on after they’ve already switched lanes. The CC comes equipped with the Lane Change Feature that blinks three times with just a tap and immediately stops. Can’t you people hear the ticking noise? Another neat feature of the CC is the electronic parking brake that’s lever- and pedal-less. It’s just a button that you click to engage and disengage. Genius. One of the simplest housekeeping things to keep in mind with your car is tire pressure. I typically checked air pressure in my car every couple weeks while getting a fill up, but I know some of you are guilty of not doing this or you know someone that is, right? Well, the CC automatically does it for you and alerts you to low tire pressure in the center cluster of the dashboard. Now you don’t have any excuses and you’ll save yourself money on gas and tires with this feature. Available on the VR6 models are Bi-Xenon headlights that shift 15 degrees in the direction you’re going. I don’t know what it is about these new-fangled headlights that I enjoy, but I dug them on the MKS and CC. It might have something to do with growing up in the West Hills of Portland where all the roads in my neighborhood were twisties. 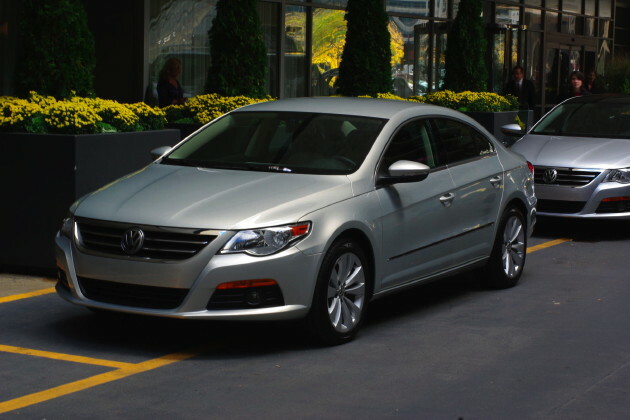 Well, that’s just a quick summation of the tech-related features of the Volkswagen CC. The CC offers a touch of class and adequate muscle without breaking the bank.